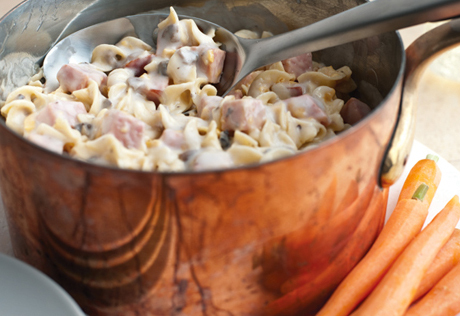 Sure to become a family favorite, this quick cooking casserole combines cubed cooked ham, noodles and tender onions blended with a creamy cheesy sauce. Heat the oil in a 4-quart saucepan over medium-high heat. Add the ham and onion and cook until the onion is tender. Stir the soup in the saucepan and heat to a boil. Reduce the heat to low. Add the cheese and stir until the cheese is melted. Add the noodles and cook until the mixture is hot and bubbling. Serving Suggestion: Serve with glazed baby carrots: steam carrots with a touch of butter, brown sugar and cinnamon. For dessert serve vanilla yogurt with fresh blueberries. I have never been one to not follow a recipe, but I was looking for a recipe that used ham and Cream of Mushroom Soup. I didn't have enough cheese or egg noodles, so I used macaroni and the following cheeses, which I had on hand: cheddar, hot pepper, and cream cheese. I also added about 1/2 clove of garlic (in with the ham and onion) for flavor. It was really good! It was like mac'n cheese with ham and onions. Mmmmmm mmmmmm good! I think this recipe is one that would be good with whatever you have on hand... throw it in there! Very versatile. My family loves this recipe. It is tasty and easy to make from leftover ham. Fast and easy. But used cream of potato soup instead of the mushroom. Very yummy! I had extra ham after Christmas and wanted to make something different. I made the recipe as stated except I did not have any Cream of Mushroom soup, but I had leftover green bean casserole which has the soup in it so I used them. They really added nice color and good taste. I added a cup of milk as others have suggested and it was ready in 15 minutes. My family loved it!